In his prefatory note to Nathan Van Patten’s The Lost Bookplate of Arthur Machen (Greenwood Press, 1949), Vincent Starrett refers to Machen’s bookplate as “one of the great rarities in its field.” Starrett mentions a letter from August 15, 1922, in which Machen notes his bookplate “dates from the early nineties. I think I have now only one book containing it, and the plate itself disappeared long ago.” Van Patten asserts that the bookplate’s designer is G. P. Jacomb Hood, who produced the etching used as the frontispiece for Machen’s translation of The Fortunate Lovers, published by George Redway in 1887. At the time when Van Patten’s booklet was published, only three copies of Machen’s bookplate were known to exist: : 1) one in Machen’s copy of The Great God Pan, referred to by Machen in a letter to Starrett dated November 1, 1923, whereabouts unknown; 2) one in Machen’s copy of M. P. Shiel’s Shapes in the Fire, which was owned at the time by Adrian Goldstone; and a copy of the bookplate, presumably loose, cataloged by Thomas Thorp, a bookseller, in 1922, whereabouts also unknown. A fourth example of Machen’s bookplate was reproduced in Steve Eng’s essay “M. 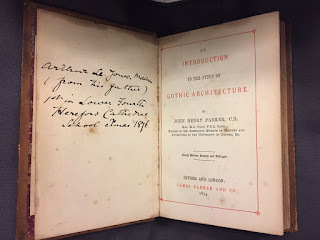 P. Shiel and Arthur Machen: Parallels in Life and Literature” in Reynolds Morse’s M. P. Shiel in Diverse Hands: A Collection of Essays (Reynolds Morse Foundation, 1983). This example of the bookplate is taken from Machen’s copy of the John Lane edition of Shiel’s Prince Zaleski, which at the time belonged to Shiel enthusiast John D. Squires. Machen’s copy of Prince Zaleski was unknown until Squires acquired it from Massachusetts bookseller Harold M. Burnstein in March of 1980. This copy of Prince Zaleksi is part of the Squires’ archive currently being cataloged by noted bookseller Lloyd Currey. 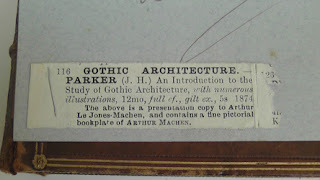 Excited by the prospect of getting to see images of this example of Machen’s bookplate, which is still unknown to most Machen enthusiasts, I wrote Sharon Agar, a metadata specialist at the British Library, to see if she might be able to send me scans from the book. Thanks to Sharon and her colleagues at the St. Pancras location, the images below have been made available for us to enjoy. 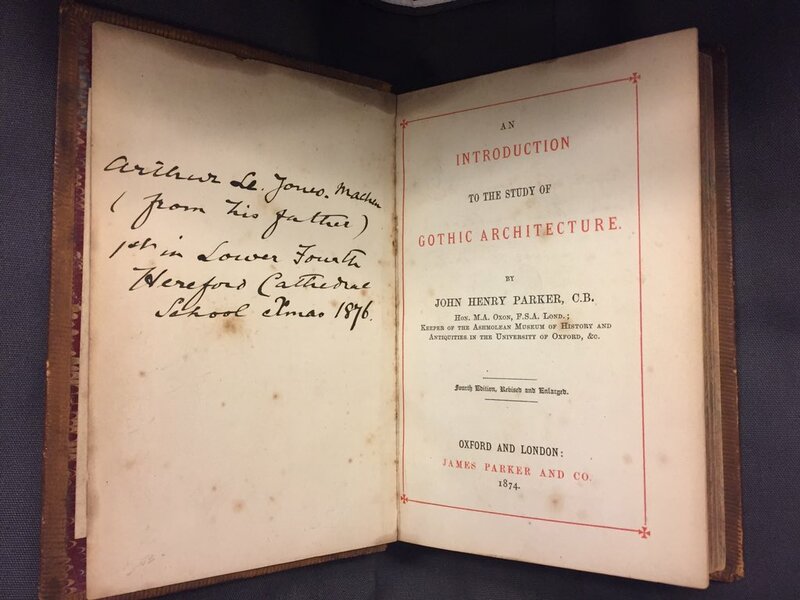 The book in question is John Henry Parker’s An Introduction to the Study of Gothic Architecture published in 1874 by James Parker and Company. 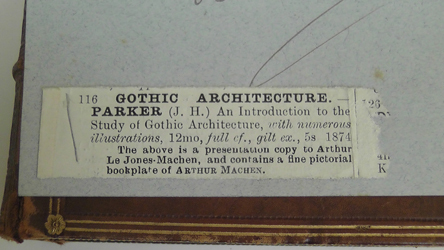 As his father’s inscription indicates, Machen received this book as a Christmas present in 1876 when he was just fourteen years old in the Lower Fourth at Hereford Cathedral. 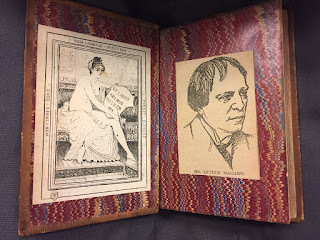 As Ray was reading over an initial draft of this post, he suddenly recalled that UK bookseller Neil Parry had acquired two copies of Machen’s bookplate, both loose, in either the late 1980s or early 1990s. Neil and I are old friends, and I immediately sent him an inquiry to confirm Ray’s claim and learn if these bookplates were still in Neil’s possession. Neil quickly confirmed that he did once own two copies of Machen’s bookplate. On a whim many years ago, he had written a well-established UK dealer who specialized in bookplates and was amazed when the dealer responded to his inquiry by offering him two copies of Machen’s bookplate. Although Neil sold these bookplates to collectors a while back, he recalled an interesting detail about them: “I can confirm that the two plates were slightly different, the colour of one was of light green and the other brown.” Could this variation in color account for the “two varieties” of Machen’s bookplate listed in Fincham’s reference book? Without seeing them or additional examples of Machen’s bookplate, we will probably never know for certain. Are there even more extant copies of Machen’s bookplate floating around in the ether? Almost assuredly there are, and ideally the collectors and curators who “rediscover” them will continue to share them with those of us who love Machen’s work and all things related to him. This is the sort of post that makes Wormwoodiana a delight. Brilliant, a rare glimpse into a scholarly world long before a garish internet destroyed the fabric of dreams by 'finding everything at ease', thus depriving the seeker of what ultimately lies at the heart of the journey: the sense of wonder.